So we’ve been doing rather well on the cultural front lately. Many months ago we’d booked tickets to the season premier of Verdi’s Simon Boccanegra at the Metropolitan Opera, and the appointed date came around on April 1st. Some lovely friends had given us an Open Table voucher for Christmas, so we treated ourselves to a fancy Mexican meal beforehand, which made a nice change from our usual practice of smuggling in sandwiches for the interval. 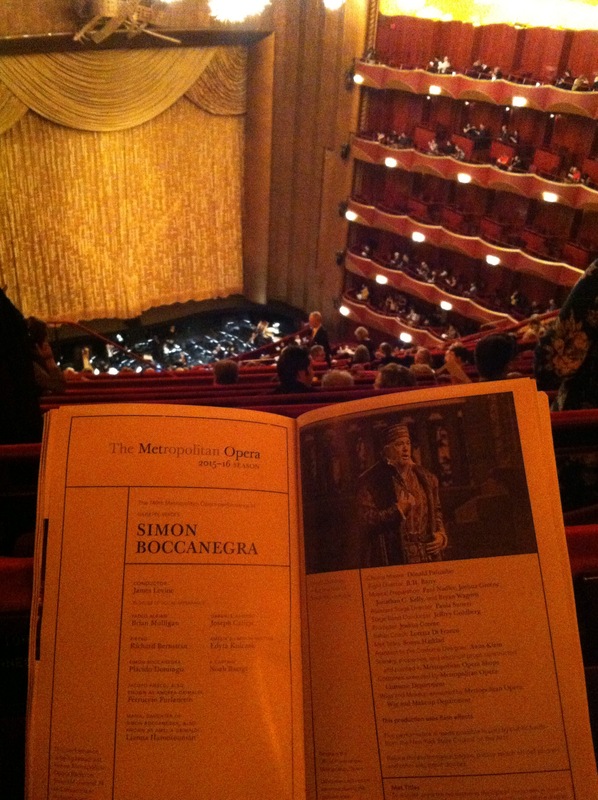 I have to admit that I’d never heard of Simon Boccanegra prior to spotting it in the Met’s season guide last year, and we booked it almost completely because Domingo and Furlanetto were performing. It was actually rather good though. Musically-speaking, it was much more Wagnerian than the Verdi I know and love, so Tom was happy too. Then last Friday found us enjoying some Wagner, this time at the Morgan Library’s exhibition about the Ring Cycle. I enjoyed this much more than I expected to (and didn’t have to dedicate 5 hours of my life to it). Among all kinds of interesting letters, set and costume designs and newspaper reviews, there were a number pages from Wagner’s composition draft, which I found particularly engaging. And obviously our resident Wagner fan had a lovely time too. Dinner was slightly less fancy, but nonetheless enjoyable, at one of our favourite burger places. Walking across midtown to church on Sunday morning, I spotted a golf ball abandoned on Broadway, and a ballet dancer having a photo shoot in Grand Central Station. I love that there are so many intriguing things to see and do here, life is certainly never dull! This entry was posted in Museums/galleries, Music, Uncategorized and tagged food, Metropolitan Opera, Morgan Library by Emma Davidson. Bookmark the permalink.